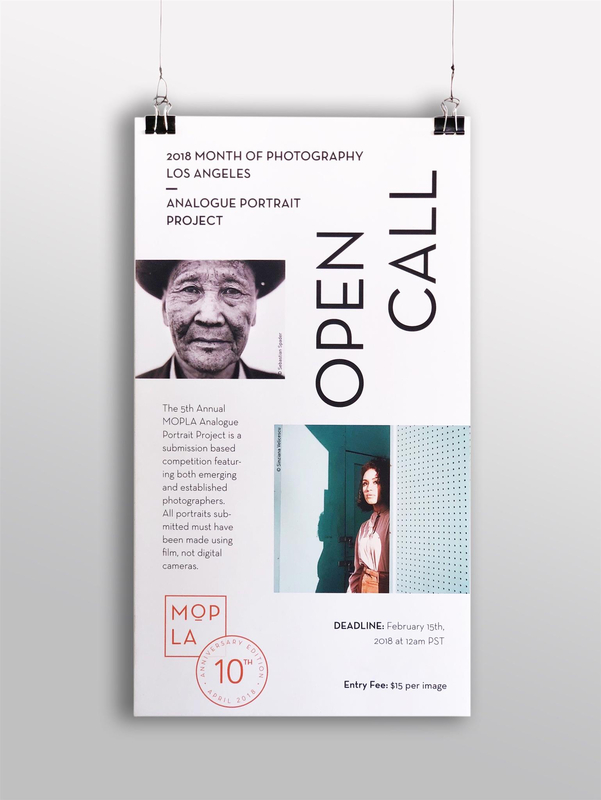 Month of Photography Los Angeles is accepting submissions for the 5th annual Analogue Portrait Project! The MOPLA Analogue Portrait Project is a submission based competition featuring both emerging and established photographers. All portraits submitted must have been made using film, not digital cameras. Artist’s reception and APP Exhibition of the 25 Winners selected will be held on Friday, April 27th at Smashbox Studios in Culver City! Max 5 images per artist, submit images as independent entries for judging. PRIZE DETAILS: Featured in a month long exhibition in Los Angeles at Smashbox Studios! Not eligible to enter? - Find contest where you are. COPYRIGHT: This submission process DOES NOT guarantee that your work will be selected to exhibit during Month of Photography Los Angeles. While all submissions are reviewed by our team, not all submissions will be selected. By submitting to the MOPLA Group Show or Host Space Open Calls, you agree that we can potentially curate a selection of images from your submission for Pro’jekt LA, MOPLA's very own projection series. USAGE RIGHTS: This submission process DOES NOT guarantee that your work will be selected to exhibit during Month of Photography Los Angeles. While all submissions are reviewed by our team, not all submissions will be selected. By submitting to the MOPLA Group Show or Host Space Open Calls, you agree that we can potentially curate a selection of images from your submission for Pro’jekt LA, MOPLA's very own projection series.